Russia is a secular state, but about 80 percent of Russians describe themselves as Orthodox Christians. However, there are Catholics, Protestants, Muslims, Buddhists and many other religious believers throughout the country, including many people who consider themselves atheists. Here are some stories of couples who managed to form a lasting romantic connection despite different religious views. Zarifa: All of my family is Muslim, despite the fact that this religion was prohibited in the USSR. They know little about Islam but they memorized the main prayers during their childhoods. My marriage to a Christian was a catastrophe for my parents. But over the course of time, they got to know Misha [Mikhail] better and liked him. My parents understand that my husband doesn’t discourage me from following my religious beliefs. 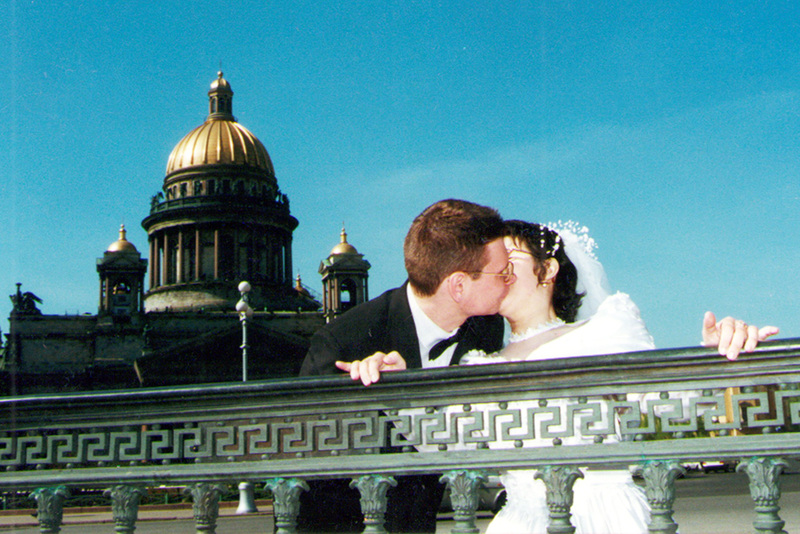 Mikhail: When we met, I wasn’t baptized but I wanted to become Orthodox. I was indifferent to Islam. I only knew that some Muslim movements justify violence, but this has nothing to do with my wife. As time passed, we shared our cultures with each other – for example, I learned the word “suublyk,” which means a small good deed on the occasion of joy or mourning. Zarifa: I don’t try to change my husband’s religious views. He was baptized after the age of 30 and had been preparing for it for a long time. Still, we argue about religion. I try to convince my husband that Islam is a fair and unselfish faith, while in the Orthodox Church even asking for a prayer costs some money. Misha says that in the name of Allah people commit terrorist attacks. But it is no use to discuss such fanatics–they don’t understand the true essence of religion. Zarifa: We celebrate both Orthodox and Muslim holidays. I help to paint the eggs on Easter, and I set the table after midnight so that Misha can break his fast. On Muslim holidays I give alms and care for the poor. Mikhail: In most cases, the traditions are just the formalities for us, however, I try not to cook pork. As for Orthodox holidays, we celebrate Christmas and Easter at our home and with my parents. Zarifa: My husband does everything he can to avoid awkward situations. He even puts his sacred books and icons on the upper shelf where I can’t see them. Mikhail: Almost nothing bothers me. If problems appear, we quietly solve them. Mikhail: One of my acquaintances was joking around and said that now that I am married to Zarifa, I must become a Muslim (laughs). Zarifa: We just had a civil ceremony in the registry office without any religious service. As for baptism – we want to adopt and we will give the child the opportunity to make that choice. I’ll teach the child about Islam and Misha can teach about his religion. Who will be more convincing? We’ll see. Marfa: Religion is an indispensable part of my life. For a long time, I believed that I would find someone to date among the Jewish bachelors. But then Artem appeared and spoiled it all (laughs). Artem: I celebrate most of the Orthodox holidays with my family. But I believe that the main thing is to have faith in your heart. Marfa’s traditions have broadened my mind, for sure, and I try to follow them because it’s really important to her. Marfa: My mom simply believes in God and practices almost all religions. That’s why I’ve been used to different types of traditions since I was a child. But my preference is given to the Jewish ones. Artem: I celebrate Orthodox holidays with my family, but I spend the Jewish ones with Marfa. Marfa: Orthodox cathedrals frighten me: everything is covered in gold, the atmosphere is formal... I don’t like it. People in synagogues are simple, very domestic. But Artem doesn’t go to church very often, and never asks me to go with him. Artem: If Marfa keeps refusing my proposal then I’ll have to convert to Judaism. Marfa: I’m afraid, it is not worth it. Marfa: I think it isn’t really important how you chose to get married, the important thing is what you feel in your soul. We’ve had some conflicts about the issue of baptism, but we decided that we would allow our children to choose for themselves. I’d like them to grow up participating in Jewish organizations – I know from my own experience that they are really good. Artem: I haven’t thought about the wedding ceremony yet. But if we are talking about Jewish organizations – I’m absolutely for them because I have seen how wonderful the conditions are for children in the Jewish community in Saint Petersburg. But it’ll be their choice. On the whole, I’m a strong Orthodox Christian but I can be convinced by the strength of the common sense (laughs). Eugene: Yes, we argued a lot. I tried to convince Dasha that God exists. But now I understand that people should realize this on their own. Eugene: I’m sure that the rite of baptism helps to protect a child, but I am not going to impose anything on a baby. I haven’t thought about the importance of a church wedding ceremony yet. Daria: This year I helped to bake the Easter cakes. Why should I refuse if they are so tasty? When my friends tell me “Christ is risen!” I understand that they are joking. I can give a proper answer to people, but I don’t know to please them. Eugene: Religious holidays have always been ordinary days for me, and Easter cakes are only desserts for family holidays. Faith is inside. Daria: I really can’t understand why people go to church to have their water and Easter cakes blessed. Will it heal them from all diseases or what? And the tradition of keeping religious icons in the car…Does God protect only those who have an icon on their windshield? Eugene: So… A small icon does not occupy much space. But what if something does exist, there up above, and it’ll help? Read more: 70 years together: Could you do it?